The very fat and heavy book strikes with a whomping 600 pages of awesomeness. The Diviners was definitely something I don’t usually read. Dark, deep and pos-i-tute-ly twisted historical fiction that kept me shivering and content. 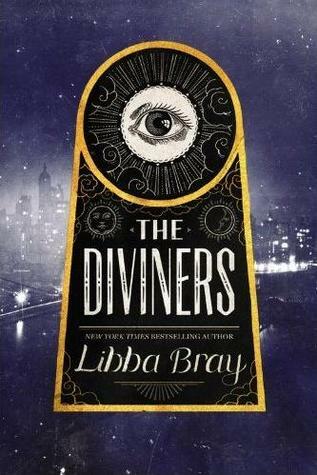 I found it extremely hard to review The Diviners, you’d probably expect a long review for a long book but after a reading/reviewing slump, I just guess that is not the case. Short review ahead! I admit, this book was horribly hard to get into, with the writing so cryptic, old and slow, I felt like I was going to DNF this. Thankfully though, after about 75-100 pages, The Diviners redeems itself back with a intriguing story line. Historical fiction is not what I’d call ‘down my alley’ I have read quite a handful but probably only liked one or two of them, however, Libba Bray’s immaculate writing and descriptions, really caught me. Evie is one of the main points that kept me going in this book, most people would label her as a shallow girl but I felt like Evie was rather open and respectable in that aspect. Yes, for some readers, they just cannot hear Evie but as this lengthy story develops, Evie’s character personality refines too. What I most enjoyed out of Evie’s connection with her fellow residing characters was how each and everyone of them were uniquely definable. Evie and Sam’s dialogue was uber-amusing, and entertaining, similarly to Evie and her friend Mabel’s. But the one that shattered all the others was Evie’s development with her uncle. They were thrown together to solve a mystery, and because Evie got kicked out of her home town but the way they developed as a dynamic-duo was so realistic and admirable. At the start, they were more like enemies but as stories go, The Diviners place characters in a vital position and connect them in an unthinkably smart way. Like I had said before, many people abandon this book because of the olden language. Yet still as I went through reading, it began to familiarise with me and eventually, I loved it! It seemed so posh and formal–even though Evie was rather a scandalous character. Libba Bray succeeds in balancing each of these themes to create a beautiful book that made me feel like a Manhattanite/New York lady that stopped along the impeccable descriptions of the eerie scenes. The Diviners is a unique read that kept me thinking of how the hell the next book is going to be better than this. For a first timer of reading Libba Bray’s book, I’ll be looking out for her others. Recommended for historical fiction lovers and (for some odd reason), reminds me of The Book Thief. I really liked this book too! I actually listened to the audio of it which was super fabulous!! I can’t wait for the next book! Lovely review, said everything I felt, though urging myself through the first couple of pages was worth it! Every time I see this book, I think it looks interesting! Good to know that you liked it, so maybe I’ll have to give it a try – I always love a well-written historical novel. I love historical books so as soon as I’m able to get a copy I’ll check it out. I love Libba Bray!!!!! The Gemma Doyle trilogy is so amazing just…that was like the first YA book I read so I have a very special relationship with that series! 😉 I have wanted to read this one for a while now but I always seem to forget about it. I will definitely make sure this one is taking priority and on my mind. I am a huge history nerd, so Libba Bray’s books are like answers to prayer! lol Thanks for this super good review! I appreciate longer ones; I just detest small reviews. I really want to finish this book. I started it, but Naughty John put me on edge instantly since I’m a bit of a scaredy cat. I’ve put it down but, I can’t wait to restart it. I also got a copy of the first book in the Gemma Doyle series so I might read that until I’m ready for this massive book of scary goodness. Great Review.